Roggi Knot-Beard is a Nord miner living in Kynesgrove. He mines at the village Steamscorch Mine. He can be found inside Braidwood Inn or in the mining camp outside the inn. He's an expert on mead after a lifetime of study, stating that the best mead in Skyrim can be found in Riften, which he visited as a child. He drinks more than his fair share. He owes a large tab for mead he's purchased to drink, to Iddra, who runs the inn. He's too proud to take a handout to pay his debt. He's also known to be a good story-teller. Upon raising his disposition, he will become a potential candidate for marriage. After finding his ancestor's shield, Roggi becomes available as a follower. He's a friendly sort and will joyfully greet you regardless of race. Roggi Knot-Beard wears a set of farm clothes along with some gloves and boots. 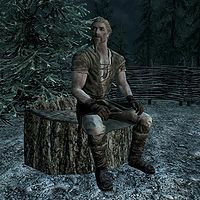 He carries three bottles of Nord mead along with a flagon and a selection of common loot and gold. He also wields a steel dagger. Roggi is tied with Sven for the lowest level cap among all permanent, non-creature followers. This page was last modified on 6 July 2014, at 16:09.